To facilitate the process of designing a learner-centered curriculum we use the Program (Re)Design Model below (Fowler, et al., 2016). This faculty-led process brings together pedagogical experts and disciplinary experts as well as educational technology experts to create a data-informed curriculum that places student learning at the center. Programs designed using this comprehensive model are well-positioned for the accreditation process. The drawers below expound on each step of the program design cycle. 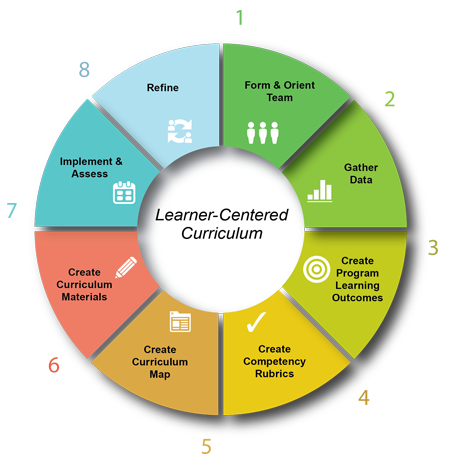 Program (Re)Design Model for a Learner-Centered Curriculum 2015 (updated April 26, 2018), created by Debra Fowler, Ph.D., Center for Teaching Excellence, Texas A&M University, is licensed under a Creative Commons Attribution-NonCommercial-ShareAlike License. Program Goals are broad statements identifying learning parameters, content and relationships between content areas – what students should learn, understand, or appreciate as a result of their studies by the time they finish a program or a major. Student Learning Outcomes (SOL) describe in concrete terms what program goals mean. SLO statements identify what students will be able to demonstrate, produce or represent as a result of what and how they have learned in a program. Unlike program goals, SLO’s are not fixed. Assessment results will then be used to make required changes in the curriculum, pedagogies, faculty professional development, student support, or resource allocation. Learning outcomes too could be revised, modified or changed for a subsequent assessment cycle, etc., etc. Competency Rubric: Once program learning outcomes (PLOs) have been created, the next step will be to create rubrics that outline the performance criteria for each outcome. Rubrics define a student’s developmental progression for each outcome throughout the degree program. They also serve as a means to evaluate student products at the overarching program level. Curriculum mapping identifies where the program learning outcomes are introduced (I), reinforced (R), strengthened (S) and/or demonstrated (D). Courses are listed across the top of the map and outcomes along the side. The center of the map is completed by determining which courses/experiences will support the I, R, S, and/or D of each program learning outcome. Which student learning outcomes will you assess? What evidence will you collect to determine learning effectiveness and gaps? How will you use the information to improve your program? Ongoing assessment will ensure that curriculum decisions are implemented effectively. Fowler, D., *Macik, M. L., Sandoval, C., *Bakenhus, C., & *MacWillie, S. (2016). Program (re)design model: A sustainable, system-level approach to faculty development. Journal of Faculty Development.